What problems does moisture create? How do we test moisture-vapor transmission? The last thing you want your customers to envision when thinking of a concrete floor is a damp, cold basement slab. One of the reasons those old basement floors were like that was because they had no vapor barrier beneath them, leaving an easy path for water vapor from the soil to migrate into the slab, assuring that the cold clammy damp feeling never went away. And dampness is only part of the problem, water vapor moving through a concrete floor can delaminate sealers and overlays, discolor acid stains, produce efflorescence on the surface, damage aggregates, cause the slab to curl, and condense beneath objects on the floor. But it doesn't have to be that way. On new interior slabs, moisture can be easily controlled and mostly eliminated. 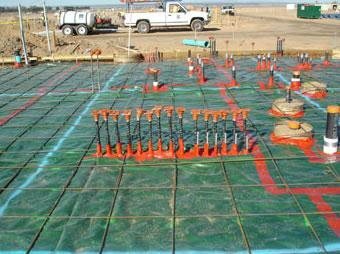 Here is information to help you understand how moisture moves in a slab and how using a vapor barrier can help control the problem.